Wayne, head honcho over at the NVMDRA recently sent this press release my way. Looks like a great venue and one to put on your schedule for next summer. As for "The Knuckledragger" and me, all I can say is "God willing, we'll be there! Vintage Motorcycle Drag Bike Nationals to be held at Eddyville Raceway Park. Eddyville Raceway Park an 1/8th mile drag strip at Eddyville, Iowa will have an all motorcycle event on Saturday, August 25, 2012. This event will be called Motorcycle Mania. This event will include a double header race for Eddyville`s Pro Bike class, a Street Bike class, and other classes TBD. The track was contacted by Wayne Skinner of the National Vintage Motorcycle Drag Racing Association about an event for vintage drag bikes. This race for vintage drag bikes has been added to the Motorcycle Mania event. There also will be a charity motorcycle ride from various places ending at the track. The charity ride will benefit the Wounded Warrior Project. Gerald Kramer, co-owner and general manager of ERP was a motorcycle drag racer for 20 years and is super excited about having the vintage drag bike event. He started racing bikes in 1968 at Eddyville and in the 70`s & 80`s raced at IDBA and Dragbike all bike national events in sportsman classes including events at Bowling Green, KY.
Gerald feels that there is a potential for this to become a very big event but will take time to grow. Wayne has laid the ground work to promote the vintage bikes and hopefully together we can grow this type of event. We are going to need the support of guys out there with the old drag bikes looking for a place to play or just display if not race ready. This event is all about having fun not about racing for big money! The persons working on the charity ride also hope to make that an annual event and if we get some cool bikes for them to see it will also grow. Eddyville Raceway Park is located about 60 miles S.E. of Des Moines, Iowa right off of Hwy 63/163 a four lane road and is easy to get to from all directions. It is a nice 1/8 mile facility with a state of the art Musco lighting system, clean restrooms, showers, good race track, plenty of parking, and a friendly staff. We are still working on details of the event such as times, entry fees, classes, payouts, etc.There will be a test and tune on Friday night and Sunday will be a raindate. Gerald can be reached by email at manager@eddyvilleraceway.com or cell # 641-780-3534. As I sat down to write this, I realized that what I was about to put into words was probably quite similar to what I wrote last year at this time. I checked, and sure enough, the main point is the same, only some details were different. Christmas is perhaps the one time of year when nearly everyone gets a little sentimental, gets a little "merrier" than usual, maybe even an little more religious. For some, it may even be the only time during the year that their shadow will darken the doorway of a Church. But what's it all about? To the sentimental it may be a time to get warm fuzzy feelings as they recall or re-live Christmases past. To the "merry" it may be the one time of year when they can count on most others to be in a good mood, when everybody is a little more friendly. To the religious though, its more obvious. Christmas is a celebration of the birth of Jesus. So have a wonderful Christmas; get sentimental, be merry, but don't forget the reason why we honor the one whose birth we celebrate! It certainly seems as though this has taken an awfully long time. More than once I have wondered if the rapture would arrive first ...but I finally have, in my possession, the production version of the oversize Knucklehead intake valves that have been in the works for well over a year. At a 2.060" diameter, these are a full 5/16" larger diameter than the stock valves they replace. Bigger intake valves in Knucklehead motors has been a "speed trick" for nearly as long as Knuckleheads have been built. These valves are the proper diameter to "do it old school" by removing the existing seat insert and grinding the new seat directly on the head. By blending the material from the bowl into the I.D. where the old valve seat was, you will wind up with a "choke" of 90% which is just about right for good flow on a Knuckle head. Back "in the day" automotive valves were typically shortened for use as oversize Knuckle intakes. While period correct, they have a few drawbacks. Shortening the valves require the use of a lash cap on the valve tip to prevent premature wear, which can throw off rocker geometry. Often automotive valves have a lot of "tulip" which requires the bottom of the already short Knuck guide to be further shortened. They also tend to be very heavy, which does nothing for performance. These 5/16 stem valves address all of those problems. For some time now, savvy engine builders have been aware that a late model Iron Head Sportster valve was a good choice for an oversize intake valve for a Knuckle due to their similar length. Though the XL's 1.940" diameter valve was easy to come by, its thinner (5/16" vs 3/8") valve stem still left it a "not so easy" upgrade. No problem getting valves, but few engine builders are inclined to machine their own valve guides. That's why I took the initiative to have a production run of 5/16" bore valve guides manufactured for Lee's Speed Shop recently. Of course that still leaves an issue with the stock valve seat inserts. 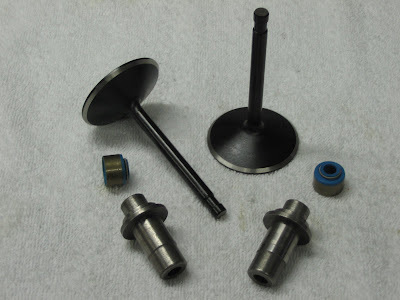 A 1.940 or a 2.0" intake valve does not fit onto the stock Knucklehead valve seat insert, and requires machining for an oversize valve seat insert. Not so with the 2.060" valve. As mentioned above, once the old seat insert is removed, a seat for the new valve can be ground or cut directly on the cast iron of the head (just as Iron Head XLs have always been). This 60+ year old performance mod for Knuckleheads has never been so easy! They are now in stock, and ready to ship. Now, chances are, if you are paying close attention you will have caught on to another logical use for these valves. If an Iron XL intake valve is a suitable upgrade for a Knuckle, then it follows that an oversize Knuckle intake valve may be a suitable upgrade for an Iron XL! That's right, a 2.060" intake valve may (I have not had a chance to try it out yet) be a good bet for a maximum effort Iron XL drag motor. In case anyone is interested in trying it, the overall length of the 2.060" valve is 3.675 as compared to the R series XL intake at 3.690. If you are wondering why anyone would set out to produce and market performance parts for a motor that has been out of production for over 60 years, then you are in good company, for I often wonder that myself. Still, it does seem that I have a corner on the market ...at least for the moment. Way back in the dark ages, when I was a schoolboy, History was not one of those classes which I disliked. In fact, I believe that I could actually admit, if pressed, to enjoying History classes. That said, when a book comes along with a title like "Motorcycle Drag Racing: A History" it is not hard to see why it might grab my attention. 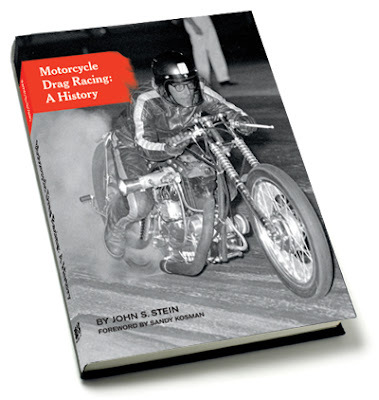 Motorcycle Drag Racing: A History, by John Stein is a 240+ page book jam packed with photos and a lively text which documents motorcycle drag racing from its 1950 birth at Santa Ana, right down to today's NHRA Pro Stocks. The size and quality put it in the category often referred to to as a "coffee table book" (yeah, I know; I don't have a coffee table either). If you are a fan of motorcycle drag racing, this is a "must have" item! Chapter titles include: The Pioneers: 1950-1960, The Sixties: The Golden Age of Motorcycle Drag Racing, The Pioneers: 1960-1970, "Congratulations, You've Got Twins." (which of course deals with the rise of dual engine drag bikes), and many others. Legendary racers such as Lloyd Krant, Louie Castro, Chet Herbert, Bud Hare and Tommy Auger are some of those highlighted from the '50s. Clem Johnson, Leo Payne, Joe Smith, Boris Murray, and Sonny Routt are just a few of the other "shakers and movers" to earn a spot in this "who's who" of motorcycle drag racing lore. My only complaint is that I wish Mr. Stein had expanded every chapter into a book of its own ...and I do understand what an unreasonable complaint that is given the large size and scope of the book as it is. But the book is sorta like motorcycle drag racing itself: its so good you just want more of it! Seriously, the photos alone are worth the price of admission. Likewise the text could stand on its own and I doubt that anyone would complain about the price; add those together and its a bargain! "Motorcycle Drag Racing: A History" can be purchased direct from Gearhead Publishing . Buy it; read it; you'll thank me for the heads up.